The Sheer Base for Drier Skin – amandarobots. I love skincare – more than I love makeup. What’s more, I like the way my skin looks – I invest in glow-inducing products and I want to let that shine through most of the time. That’s why I like sheer foundations and BB creams so much; I can get a little bit of coverage just to even things out, but still can see the healthy glow and texture to my skin. For summertime, my sheer base of choice is the Tarte BB Primer because of its oil control/moisture balance properties, but needless to say that is far too drying for me in the wintertime. 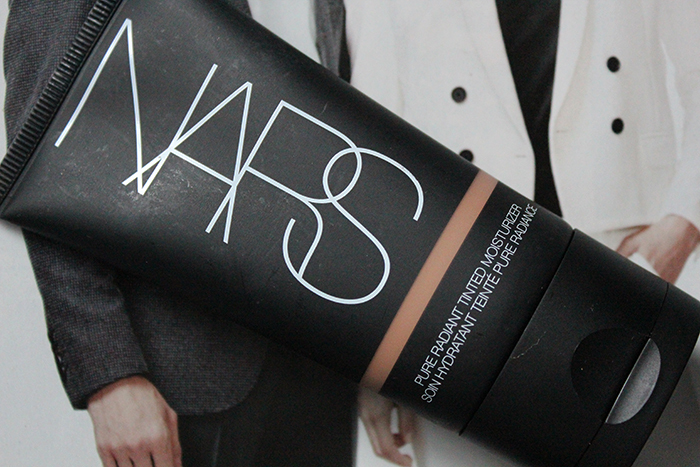 This winter, I’ve seriously been needing products that pack a moisturizing punch, and the Nars Radiant Tinted Moisturizer does just that. I’m wearing the shade Seychelles at the moment and I think it’s a really good colour match for me. I adore Nars’ shade range – they carry a variety of shades with a variety of undertones, and I can always find a match in their base products. In terms of skincare properties, this moisturizer is hydrating enough that I can wear it on its own. My skin feels comfortable when I put it on, and it hydrates and soothes my dry patches. It doesn’t get too oily throughout the day, either. The SPF in it is an added bonus, because I hate caking on a layer of sunscreen, even with the right sunscreen for my skin. In terms of coverage, it is sheer, so I don’t film videos or take intense photos with it on, but I do wear it every day for school and other outings. It’s been the perfect everyday base. If you haven’t given it a try and you have combination to dry skin, you certainly should!